James Hargreaves was Harry Hargeaves‘ younger brother. He died at sea in 1908. 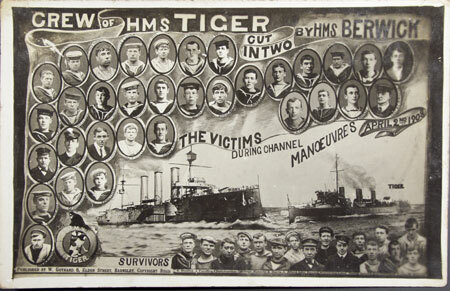 I came upon the story of HMS Tiger through my family and the postcard shown here – Harry Hargreaves was my maternal grandfather. My father’s family is from the Isle of Wight, and I lived there as a child, so the site of the accident has personal resonances too. I researched the story on the web. In response to this website, Maureen Lister contacted me about her great-uncle John St. Vincent Shaw who also died when HMS Tiger sank. The postcard commemorates the incident in which these three men and others died – it seems a little strange to produce a postcard of such a tragedy! 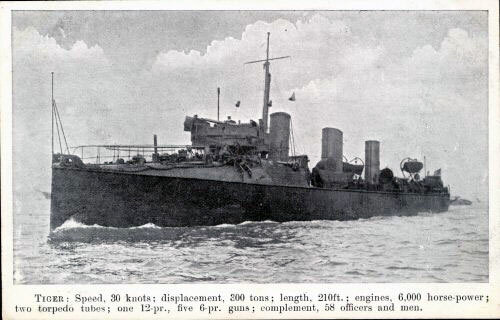 On 2 April 1908 the 380-ton destroyer HMS Tiger took part in a Home Fleet exercise 20 miles south of the Isle of Wight to test defences against torpedo boats. She had been built in 1900 for the Admiralty by John Brown and Co, Clydebank. She had a speed of 30 knots and was armed with one 12-pounder and two torpedo tubes. During the exercise, HMS Tiger crossed the bow of a nearby cruiser, HMS Berwick, and was sliced in half, her bow section sinking almost immediately. Fortunately the stern section stayed afloat long enough for most of her 63 crew to be rescued, but the captain and 27 members of the crew were drowned. This is her gun platform in 1906, a crowded and busy place. One of three vessels laid down “on spec” and purchased by the Admiralty. Launched by Clydebank Engineering & Shipbuilding Company, Yard No 335, on 19/5/1900 and lost in a collision with the cruiser Berwick off St Catherines, I.O.W. in 1908. See: http://www.clydesite.co.uk/clydebuilt/viewship.asp?id=5180 for a new page about HMS Tiger. HMS Berwick was built by Beardmore at Dalmuir on the Clyde, laid down on the 19th April 1901, launched 20th September 1902 and completed 9th December 1903. She joined the Home Fleet and served in the Portsmouth Division of the home fleet. On 2nd April 1908, The Portsmouth Division of the Home Fleet, under the command of Rear-Admiral Farquhar, flying his flag on HMS Prince George, left Portsmouth for exercise in the Channel, with the Torpedo-Flotilla following later with orders to attack the squadron after darkness had fallen. A little after 8 pm the destroyers attacked the fleet, 18 miles south of St Catherine’s with their lights out. During the attack HMS Tiger, while crossing the bows of HMS Berwick, was struck by the cruisers ram and cut completely in two. The fore end of the destroyer sank almost at once, the after part remaining afloat long enough for 13 men to be rescued form it. In all 22 of her crew were saved, but 28 were lost, including Lt W E Middleton, who was in command. 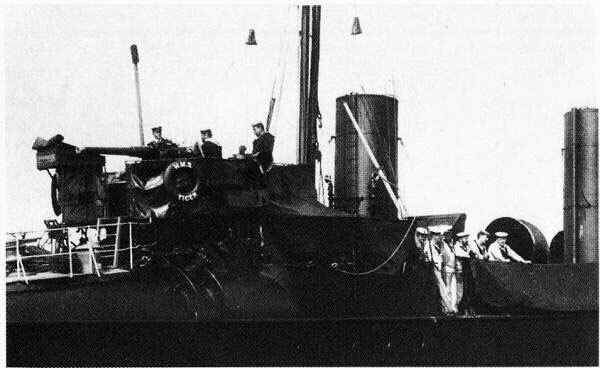 HMS Berwick was sold for scrapping in 1920. On the postcard, Jack is also in the second row down, second from the left. 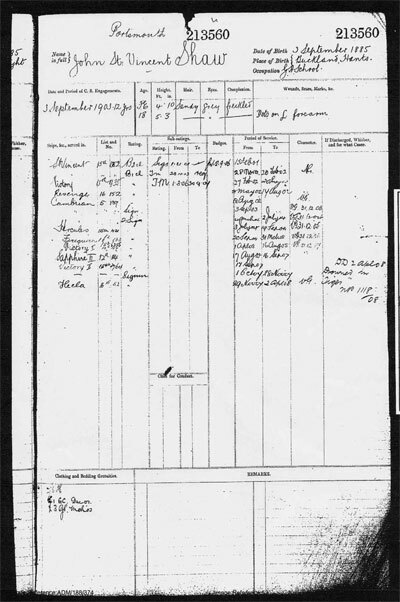 Jack was born in Portsmouth on 3 September 1885, as shown on his Naval Record. FreeBMD shows birth of John St Vincent Shaw in OND 1885 at Portsea, vol.2b p.43. The 1891 census shows 5 year old John S V Shaw living with his mother Eliza J and siblings Ethel M M and Charles LP at 15 Sutherland Road, Portsmouth. (Ancestry has wrongly transcribed the family name as Warner). The 1901 census shows a John V. St Shaw, born at Buckland, Portsmouth in about 1886, 15 year old crew of St Vincent, Royal Navy. This was a Naval Training Ship, based at Portsmouth since 1862 which trained young boys from about the age of 12 for entry to the Navy. 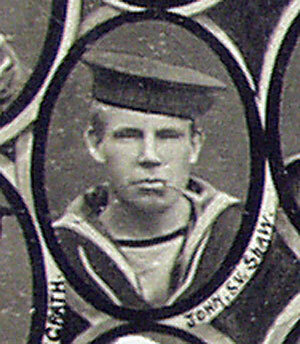 Jack’s Naval Record shows that he was at St Vincent from 15 Feb 1901 to 28th Nov 1901 as a boy seaman, second class. At that time he was 4 foot 10 inches tall with sandy hair, grey eyes, freckles and dots on his left forearm. From then until 27 Feb 1902 he was still at St Vincent as a boy seaman first class. He then went to the shore establishment HMS Victory until 20 May 1902. Throughout all his naval career Jack’s character is described as very good. From May 1902 until August 1902, Jack served on HMS Revenge. Until 2nd July 2004 Jack served aboard HMS Cambrian as a signaller. During this time, on his 18th birthday, 3 September 1903, he signed on for a period of 12 years in the Royal Navy. He was by then 5 foot 3 inches in height. From 3 July 1904 to 19 Sep 1904 Jack was on HMS Hercules. On 20th Sep 1903 until March 1905 Jack transferred to HMS Firequeen. Jack then moved to HMS Sapphire on 17 August 1905 until 16 Sep 1907. From 17 September until 28 November Jack served at HMS Victory, Portsmouth Naval Base. Jack’s final posting was to HMS Hecla on 29 November 1907. On 2nd April Jack was aboard HMS Tiger. He was among the missing, presumed drowned.